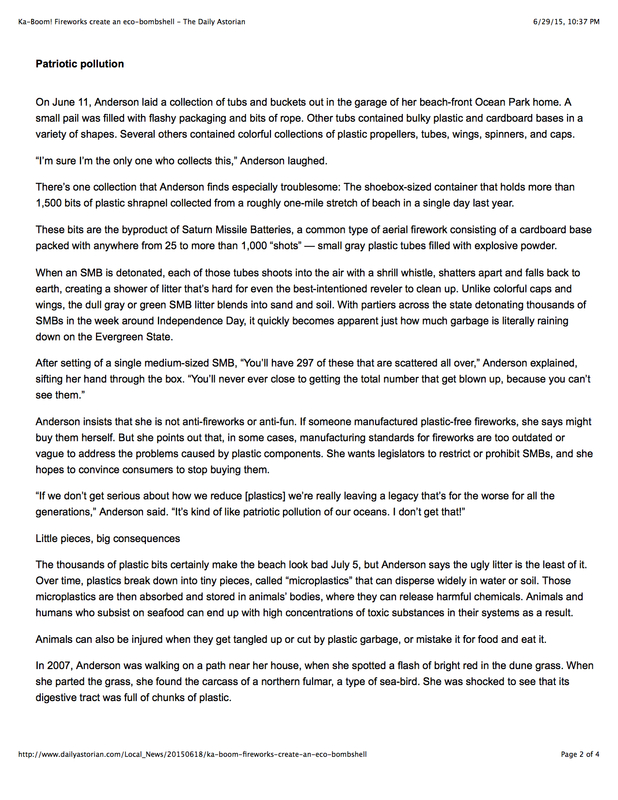 Read this before you buy 4th of July Fireworks. “Why didn’t I think of this?” Hopefully, it will influence what you won’t buy to celebrate the Fourth of July. Ka-Boom! 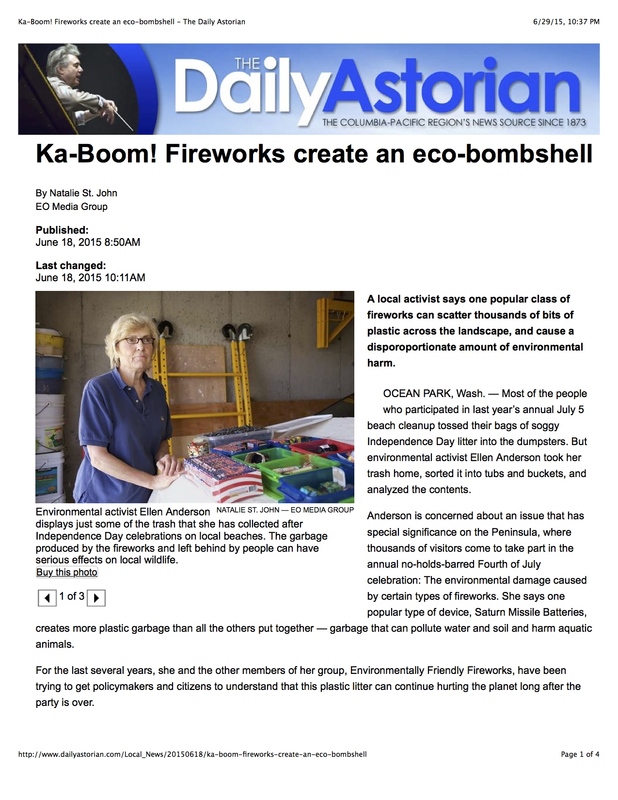 Fireworks create an eco-bombshell – The Daily Astorian. Here in SA we also have rather strict rules about the use of fireworks, not that they’re always effectively policed and enforced and I would much rather have them banned entirely. Apart from the damage to the environment and disturbance it causes to pets and wildlife, some people also seem to loose their mind around the stuff and every now and then you’ll read about some seriously injured idiot in the newspaper. Thanks for posting this information, Jane! Also, locally — because of the drought — I’m surprised that I am still seeing fireworks for sale in parts of the Monterey Bay area. I was perfectly aware of the trash fireworks spread all over the place, but never thought about the more far-reaching effects. Thanks for the info. Shared on FB. Public sale of fireworks has been illegal in this state (in fact I think all states of Australia except the ACT) for many years….. Displays of fireworks can only be performed by licenced operators with permission for the event e.g. New Year’s Eve. One off permits may be granted for charity or similar groups. I don’t think that is Scrooge-like; I support that with changing times, our perspectives and priorities about environment-impacting choices must be fluid. I fear it may be swings and roundabouts, Jane. We are less than perfect in some areas. Currently we bemoan the government lack of support for wave, wind and solar power to replace fossil fuels. So many issues… and more new ones every day, so it seems. 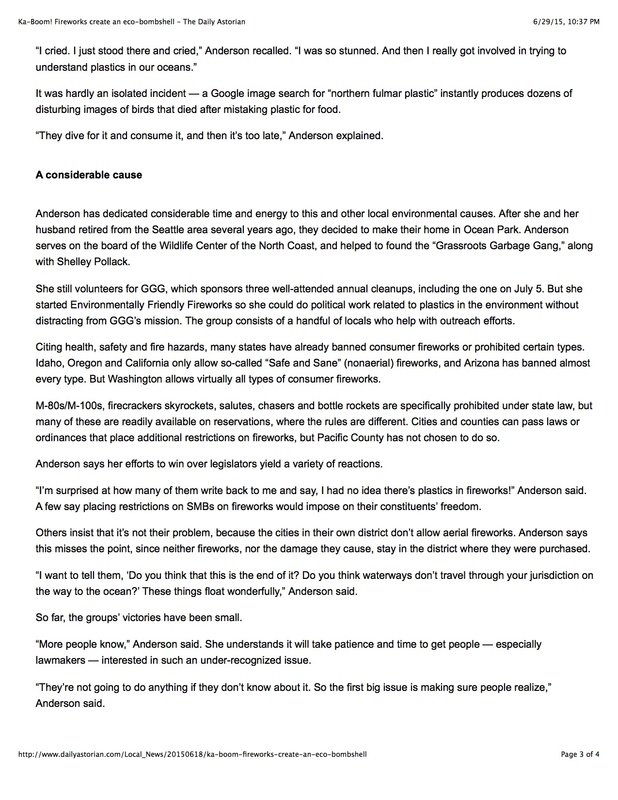 Out of all of them… picking one or a few that we can take little steps towards making positive changes should always serve as a reason for action.